G & Steve's Wedding Day! "Are you going to Flog your own wedding?" I was asked this by a number of people, and I replied, "Of course – why wouldn't I?" I've been neglecting the Flog for the last month, but I have a good excuse: Steve and I got married on Saturday, April 25th. It was a spectacular day, filled with family, friends, food and fun. It astonishes me how many different moving parts and components can go in to planning a single day, but every cog in the wedding machine worked and resulted in an amazing day that we will never forget. The day started early. 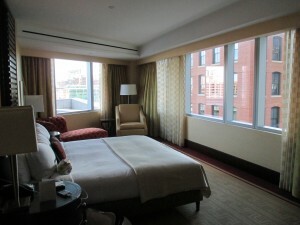 Wendy (my Maid of Honor and best friend in the whole wide world) and I stayed in a beautiful 1200 sq. 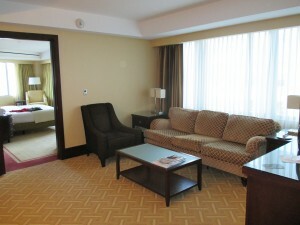 ft. suite at the Intercontinental (Thank you for the upgrade, Intercontinental). I didn't sleep well; I woke up at 3am, 4am, 6am and finally give up at 6:40am. I had an anxiety dream that it was 3 weeks before the wedding and my photographer cancelled on me. I attempted to hire a new photographer (who was Bob Odenkirk from Breaking Bad) but he kept refusing to look to see if he was available. I woke in tears. I learned later that Steve had his own anxiety dreams involving his Holy Cross classmate Fred screaming at him. The weather was 57 degrees and mostly sunny, a perfect setting for pictures. I had been checking 3 different weather sites (weather channel, accuweather and weather underground) everyday, starting 10 days before the wedding. Needless to say, I was relieved. 7:45am – Rosalba Mortone(http://www.albaroseartistry.com/) and her assistant Ashley arrive for hair and makeup. Those who know me, know that I don't wear makeup on a daily basis and that my hair gets approximately 5 seconds of brushing in the morning, so the concept of professionally done hair and makeup was foreign to me. But, I was told over and over again, it was important for the photos. Bridesmaid Christine and her sister Stefanie were first to arrive, followed by Marijane, Allison and Jes. The Food Network played in the background as we all took turns in the chairs. Time flew by, and we had sandwiches from Panera (thank you Stefanie for picking up lunch! ), and peach mango bellinis. Rosalba and Ashley were great; they finished everyone's hair and makeup by 12:30pm, right on schedule. Ashley told me that my skin was "like butter," – which is a strange (after all, isn't butter greasy? ), but sweet compliment. 11:00am – The flowers arrive. I ordered my flowers from Whole Foods. I had decided against centerpieces - there would be no room on the table once the food started, so I only had 7 bouquets, 6 boutonnieres and 2 corsages. 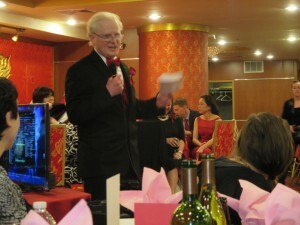 WF did a wonderful job; the bouquets were beautiful and the order cost a fraction of other quotes I had received. 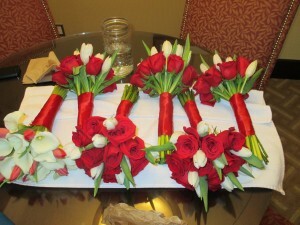 My bouquet was composed of white calla lilies and red tulips; the bridesmaid's were red roses and white tulips. 12:00pm – Lauren, the first photographer arrived right on time. The second would arrive at the church at 3pm. (http://www.laurenpagewadsworthphotography.com/). She took the mandatory shots of us getting ready, and then some fun shots of me and the girls. Getting in to my dress was easy enough, but tying the red sash was a trial. I hope Lauren got pictures of how it took 5 grown, educated women to tie a knot. It was pretty funny. At 1pm, she headed to the men to get shots of them getting ready. I heard later that there was an undershirt issue and Steve sent his best man, Bryan, to Marshalls. Steve told me that at 12:50pm, he was standing alone (everyone was a little late) and shirtless, but ten minutes later, everyone (Chris, Andi, Stracco and Joe) and his undershirt were there, just in time. Christine helped them with the boutonnieres. 1:15pm – First look pictures. I decided I wanted to do our pictures before the ceremony since we would want to spend as much time as possible with our guests. The only problem with this is that you don't get to capture the classic "look on the groom's face as the bride walks down the aisle" picture. So instead, Lauren had Steve wait outside, eyes closed, and I was led to him and we opened our eyes at the same time. It was a lovely moment of joy, mixed with the realization that this was really happening. 1:30pm – Formal pictures. Everyone gathered in the back waterfront area of the Intercontinental. The men looked dapper in their Calvin Klein tuxedos (2 button, notch lapel, apple red vests and bowties) and my troop of ladies looked stunning in their dresses. 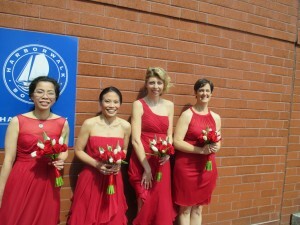 I had told my bridesmaids that they could pick any dress they liked at David's Bridal, as long as it was in apple red, chiffon and knee length. I wanted them to feel comfortable and beautiful and there was no way that was going to happen if I made them all wear the same dress. I was really pleased at the visual; coincidentally, no one picked the neckline. My flower girl, Ava (daughter of Steve's groomsmen Joe and Joy (both lifelong friends of Steve's) was absolutely precious. 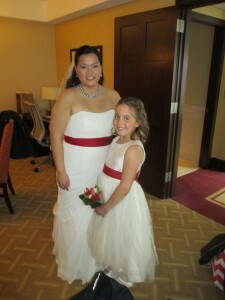 She was in a lovely shantung silk dress with a full tulle skirt and a matching red sash. She was a superstar throughout the whole day - not a single complaint or whine all day long. She listened and followed all the photographer's directions and was a joy to be around. I had scoped out different areas around the Intercontinental where I wanted shots; over the bridge, down on the dock, in front of the Boston Tea Party ship. Steve’s mother Joyce arrived, wearing a cream silk blouse and a beautiful long fuchsia skirt, custom designed for her by Denise Hajjar. We got lots of pictures and I can't wait to see them. 3:30pm – Heading over to the church. The guys hit the bar and the girls went for caffeine, while Steve and I finished our pictures. We had a couple of different cars at the hotel, so we split up. Steve and Joyce took an Uber car and Ava and I were riding with Christine and her sister. The first hiccup of the day occurred when the valet couldn't find Christine's car. 20 minutes passed and still no car. I thought Christine was going to commit homicide, but I told her that it was okay – they were not going to start without me. Finally, it was located and the short drive landed us in the parking lot at 4:10pm. On a side note, when Steve and I were considering a Chinatown wedding, the first question was "where is everyone going to park?" I was thrilled to discover we could rent a Tufts parking lot through the church that was conveniently located between the church and restaurant. 4:30pm – Game time. We lined up in the vestibule. Someone commented that weddings never start on time and I replied that if they knew me, they should know that if the invitation said 4:30pm, we were hitting the aisle at 4:30pm. Joy was a huge help; she organized us and then sent us down the aisle in order. First was Joe, escorting Joyce. All the bridesmaids went in order of height, then Wendy and then Ava. I could hear, on my side of the heavy doors, the change in music and the people rising. Deep breath. Final adjustments on the dress and veil. Back straight, shoulders down. Smile. I know that we asked the string quartet to play Pachelbel 's Canon in D for my procession, but I was so focused on walking slowly, not tripping, and smiling that I do not remember a single bar of music. I could have walked down the aisle to the polka and would not have known it. The Novo string quartet was tremendous; people told us over and over again about how wonderful the Mass was, especially the music. I wish I had video of the procession, just to confirm it wasn't the polka. 5:20pm – Our rehearsal had taken an hour and 20 minutes, so the Vegas odds were that it was going to go long, but the ceremony went smoothly, ending 10 minutes early. The readers were great, and the homily was short. People loved that we had 2 priests, including a Chinese one. There was a bit of a communion traffic jam, due to the placement of the quartet. People made their way to Hei La Moon, a short .2 mile walk away. We took some altar pictures with everyone and then Steve, Wendy and I walked with the photographer through Chinatown. There is a picture of me and Wendy, when we were 3 years old, standing in front of China Pearl, holding hands. She actually referenced the picture in her speech. I wanted to re-enact it 35 years later. I'll frame them together, side by side. 5:45pm – Introductions. 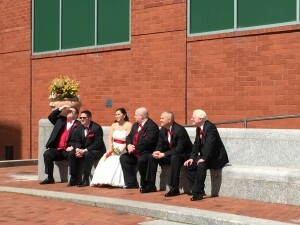 The bridal party lined up on the stairs. My DJ, Mark Simpson (http://newenglandsdj.com/) asked if he should play something exciting and I joked, "Sure – like Eye of the tiger?" He opted for Thunderstuck by AC/DC, which was pretty hysterical. We went right into our first dance. 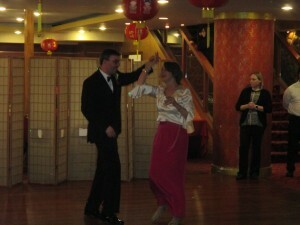 We had taken 3 private lessons at Ballroom in Boston (http://ballroominboston.com/) for a simple rumba. Finding a song for our first dance was no small feat, as Steve and I have very divergent taste in music. We finally settled on a classic, "As Time Goes By" by Jimmy Durante, the love theme in Casablanca. I'm happy to report that he did not drop me during the dip. 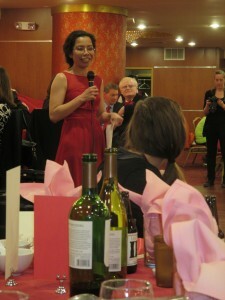 6:00pm – Speeches by Bryan and Wendy - lovely sentiments by our dearest friends. Wendy told me that she was expecting waterworks, and I did well up a little. I don't know why Steve and I didn't stand up to thank everyone for coming at this point. I wish we had. 6:15pm – Food. 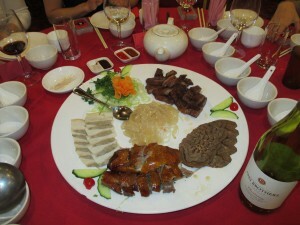 The appetizer platters hit the tables, a spread of suckling pig, roast duck, slices of beef, chicken, all surrounding a pile of jellyfish. I thought the duck and pork were the best. I was pleased to hear that most people tried the jellyfish. The second course took forever to come out, so Steve and I made our rounds and toasted every table. It was a nice opportunity to ensure we spent time with each and every guest. 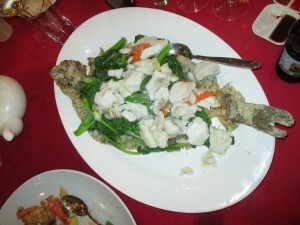 So, even though I said I would flog the wedding, it's hard to write about the food, as I barely ate any of it. 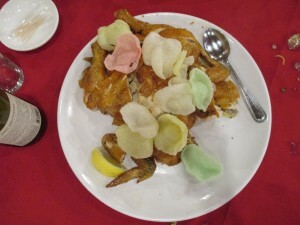 Deep fried sea scallops were on my menu, and I found out later they were swapped out for honey walnut shrimp. Lots of people told me that was their favorite dish of the night, so I guess it was okay. But the scallops are meant to symbolize wealth, so if Steve and I are ever destitute, I'll know to blame the restaurant. Chinese Dessert – Red bean soup. 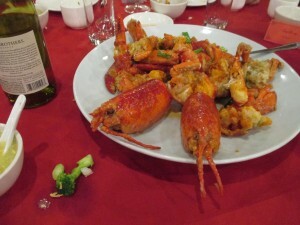 In addition to the appetizer platter, I had the chicken, lobster and fish, which were all good, especially the lobster. I had the soup and I did not like the gelatinous texture of it. I was disappointed to hear only some tables got the red bean soup. I also heard raves about the noodles at the end, but a lot of people were too stuffed to even try them. 8:00pm – Cake cutting. The food was coming out more slowly than I had anticipated. I assumed the dessert would be served at 8pm and I scheduled the cappuccino cart (http://www.espressodave.com/) to start at that time. So, despite the fact that courses 9 & 10 (the fried rice and noodles) were still to come, it was cake cutting time. We went non-traditional and cut the cake to "Short Skirt Long Jacket" by… Cake. I wanted to scoop ice cream to Sarah McLachlan's "Ice Cream," but Steve hates that song. I had the toughest time estimating the correct quantity of desserts to order. I ended up getting 13 dozen cupcakes, 18 dozen cookies and 7.5 gallons of ice cream. The cupcakes were from Quebrada Bakery in Arlington (http://quebradabakingco.com/) and I had a mix of chocolate mocha, chocolate coconut, vanilla, and carrot cake. They told me if I could wait till 1pm to pick them up, they would bake them fresh that morning. I was thrilled with the idea of less than 12 hours from oven to mouth. 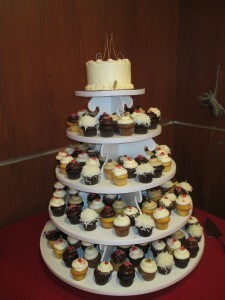 Normal wedding cakes take 2-3 days to bake, cool, frost, assemble and decorate. That is why wedding cake tends to be dry; it's been sitting around for 72 hours. I had 4 dozen cupcakes left over. 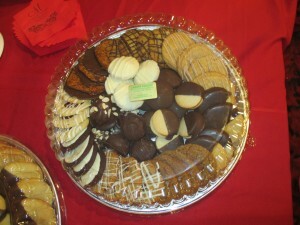 The cookies were from Lakota Bakery (http://lakotabakery.com/): Florentines, Lemon filled Macaroons, Rum Balls, Tuxedos, Chocolate Chip, Old School Peanut Butter, Raspberry Linzer, Ginger Molasses, Chocolate Ginger, Hazelnut Shortbread, Snickerdoodle, Oatmeal Raisin, and Coconut Almond Joy. There were cookies left over at the end of the night, but people were taking them home, so it's hard to get a real count. I would say there was 3 dozen leftover. The lemon macaroon is my absolute favorite. The ice cream was another hiccup. I had ordered three containers of 2.5 gallons of ice cream from Christina's (http://christinasicecream.com/). Two were standard flavors (Coffee and chocolate explosion) but the third was a custom flavor (black cherry vanilla). When Brian went to pick up the ice cream (Thank you, Brian for getting all the desserts!) they did not have my order. He subbed a French Vanilla instead. The bright side is they did not charge me for any of it. There was far too much ice cream, and at the end of the night, the waiters were digging in to it. Espresso Dave and his cappuccino cart was a last minute addition to the wedding. 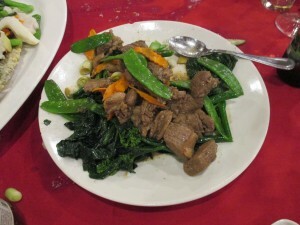 The restaurant, being Chinese, does not serve coffee and Steve declared that we had to have coffee with dessert. I investigated a bunch of options, including a table of Dunkin' boxes of Joe or renting my own coffee urns, but all plans had flaws (could you imagine a table littered with cardboard boxes of coffee?). I googled coffee catering and found Espresso Dave. I was excited at the prospect of custom hand crafted espresso beverages. I hired him, only to find out that although he offered cappuccino, lattes, mochaccino, chai lattes, all in regular or decaf, hot or iced, flavor shots, and non-dairy options, he did not offer… coffee just plain old Joe. I was worried the older generation would be overwhelmed by the fancy schmancy coffee, but I think it turned out okay. I didn't have any complaints about the lack of normal coffee. Steve thought the cappuccino cart was awesome and enjoyed an iced mochaccino to cool off from the dancing. The bar was manned by my co-worker Kristin and her sister Nicole. The restaurant allowed us to bring in our own liquor, and we offered Frei Brothers Cabernet and Chardonnay on the tables, and more wine, beer (Bud, Bud light, Lagunitas, Harpoon IPA, Sam Adams, Stella Artois, non-alcoholic beer), hard cider and hard lemonade at the bar. Kristin and Nicole did an amazing job managing the alcohol. I used a drink calculator and estimated 6 drinks per person. At the end, people drank approximately 4.5 drinks on average, so my guests did not drink enough. 8:30pm – Group pictures. I flubbed. I made a list of all the shots I wanted and then failed to email it to the photographer. I was bummed that there were some pictures I wanted but missed (like the hockey team or our trivia crew). We gathered different groups on the dance floor, like the McDevitts and the Francises. Steve got a nice shot of all the Holy Cross Alumni with the school flag. We had a mob of bridge players; I can't wait to send that picture to the Bridge Bulletin. 8:45pm – Mother/Son Dance. Steve and Joyce danced to Sinatra's The Way You Look Tonight. They looked so happy. 8:50pm – Dancing. We had given Mark, the DJ, a list of music to play during the meal and we let him know that 80's was probably the best way to go. He played some questionable songs (Poison? Baby got Back?) but people seemed to love it and got into singing and dancing, so what do I know? People were so enthusiastic crystals got knocked off the chandelier, TWICE. 11:15pm – Last dance. We chose Mazzy Star's "Fade into you," which is a lovely, soulful ballad, but is utterly inappropriate for a wedding as it is about falling in love with someone that is damaged and incapable of living up to expectations. That said, we both love the song. 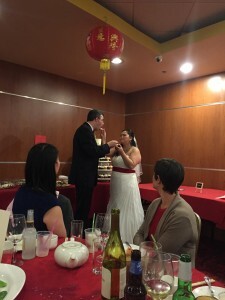 Chinese tourists – hysterically enough, people from the rest of the restaurant were fascinated enough to take pictures and videos of the wedding. I'm sure there is a video of Steve and Joyce's dance on the Chinese version of YouTube. Full service bartenders – apparently Kristin and Nicole gave Steve's cousin a ride back to the Legion in Medford, and then had drinks with him! What other bartenders would serve you and then make sure you got home okay? Mama & Papa Tsoi – I think they were completely overwhelmed by the festivities, but they took it in stride and warmly greeted everyone who came up to meet them. Favors – Playing cards with our names and the wedding date on them. We met playing while bridge – what could be more appropriate as a favor? Matthew D. – Our apologies if he hit on or said or did something inappropriate to you or your spouse, but, it is part of his charm. Uber – We opted to use Uber instead of a limo service. Our driver from the restaurant back to the Intercontinental was so tickled pink, we took a picture of us in our wedding garb in his backseat. My dress – I joked that it looked like something out of a CSI episode: I tore the hem during the pictures, the train was filthy from walking around, the bustle was busted from busting-a-move, it was stained with wine (Thank you, Matthew D.) and what I thought was blood, but turned out to be chocolate. I didn't care – after all, I wanted to dance and have fun, not worry about the dress. 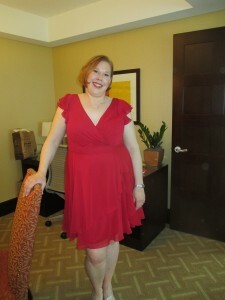 I'll be donating my dress to Brides for a Cause (http://bridesforacause.com/donate-your-wedding-dress/). If you are still reading, thank for sticking with me to the end. People always talk about how fast the big day goes and how it was all a blur. For me, it was important to get these words down, so that I could remember every detail that I could before it fades away. Regardless, what I won't forget is general feeling of elation all day and how happy and blessed I felt that all these people came near and far to celebrate with us. It was truly a once in a lifetime day.